2017 Vermont Muzzleloader - A Four Pointer! - the4pointer.com | Real Hunts. Unreal Stories. I had just settled into my new role as a big buck killer, and then a young four pointer walked in front of my crosshairs and ruined it. My notoriety was short-lived, but alas, all good things must come to an end. Similar to The Biggest Little Buck Ever Killed that I wrote about a few weeks ago, this buck also had a death wish. As hard as a tried to mess up the hunt, he was even more so resistant to the idea of remaining alive. Muzzleloaders can be finicky implements. They are supposed to shoot a bullet when the trigger is pulled, but they don’t always perform as expected. Sometimes they just pretend. Other times they procrastinate. And finally, after all other options have been exhausted, they shoot. The trick is to find a deer that is willing to hang around long enough to experience all three. Opening morning of Vermont Muzzleloader season was beautiful. Temperatures were in the upper 20’s, and the leaves were crisp. My thermos was filled with coffee for the morning sit and my bladder was already full of it from my time at home before leaving. My thermos is an older model – a Stanley Classic that keeps liquid warm for anywhere from thirty minutes to three hours depending on the outdoor temps. I use this as a gauge for how long I plan to sit before going for a walk. There is no sense in sitting next to a thermos of cold coffee, nor is there reason to carry an entire pot’s worth in your pack on a long hike. Two hours was my projected timeframe before moving. My Vermont rifle season was cut drastically short when I filled my tag on The Big One opening day. This left me sitting at home, antsy to get back in the woods to do some exploring. So when opening day of muzzleloader finally arrived, I couldn’t wait to finish my pot of coffee and do just that. As the coffee dwindled in my thermos and the time approached to pack up my things, a heard that unmistakable noise of a deer walking in the leaves. My plans to go exploring would soon be cut short yet again. So Frustrating! Out walked a four pointer. Now, you might ask yourself why a big buck killer like myself would even fancy the thought of shooting such a small buck. It should be known that I even asked myself the same question as he continued to walk by. What will people think? Why do I need to shoot another one? I even reached for my phone to take a video of him instead, but the burning sensation in my pocket from my muzzleloader buck tag kept getting hotter and hotter, clouding my ability to sort out all the voices in my head. The next thing I knew I was staring at his front shoulder through the scope. It is really weird how things like that happen. I squeezed the trigger when he presented me with a nice quartering away shot, except the gun didn’t fire. Only the primer went off. “Maybe it’s not meant to be?” I thought. Bound and determined to discover if it wasn’t, I dug out another primer and stuck it where it belonged. I cocked the hammer, took aim again and squeezed the trigger again. Another misfire….BANG!!!! Nope! A delay fire! I peered through the smoke and to my amazement the buck was still standing there. Neither he nor I know where the bullet went, but it did make it all the way out the end of the barrel, which made reloading an easier task. As he stood there trying to figure out the reason for the low hanging cloud of smoke wafting his way, I scrambled to find my quick loads. Now the challenge was really on. If it was indeed not meant to be, I sure as shootin’ wasn’t going to go down without a fight. I reloaded with a speed that would have rivaled a Civil War soldier during an intense battle. 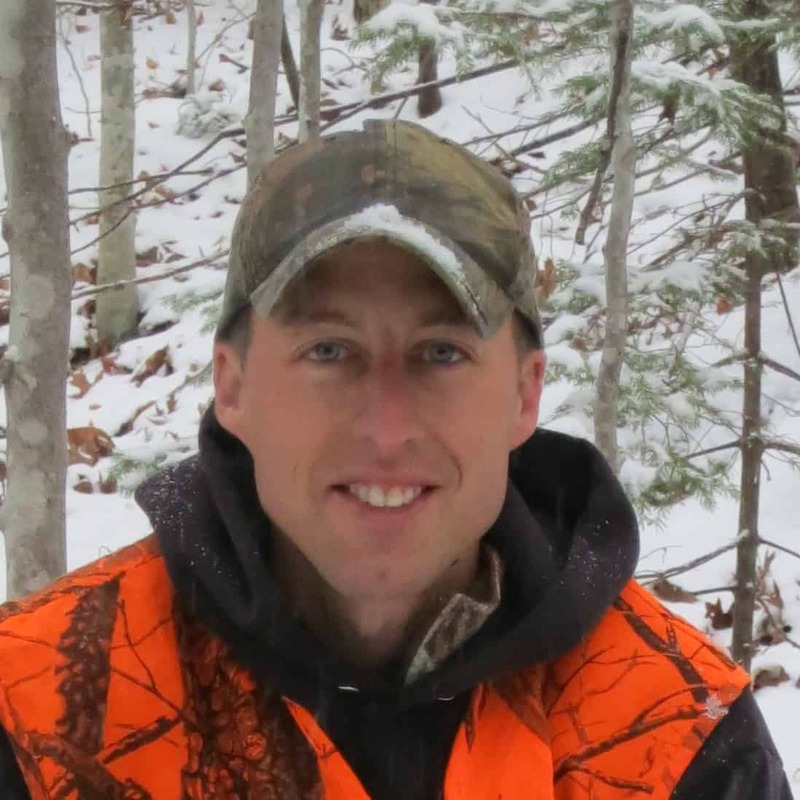 The wary buck, having finally sensed something was amiss, bounded for cover into the hemlocks about ten yards from where the first bullet whizzed by him. Was it the smoke cloud that tipped him off? Maybe it was the clanging metal sound from the ramrod banging on the barrel as I pushed another bullet down. It’s intelligence like this that is why little bucks survive to become big bucks. Stupidity is what kills them. This buck still had a little of that in him. 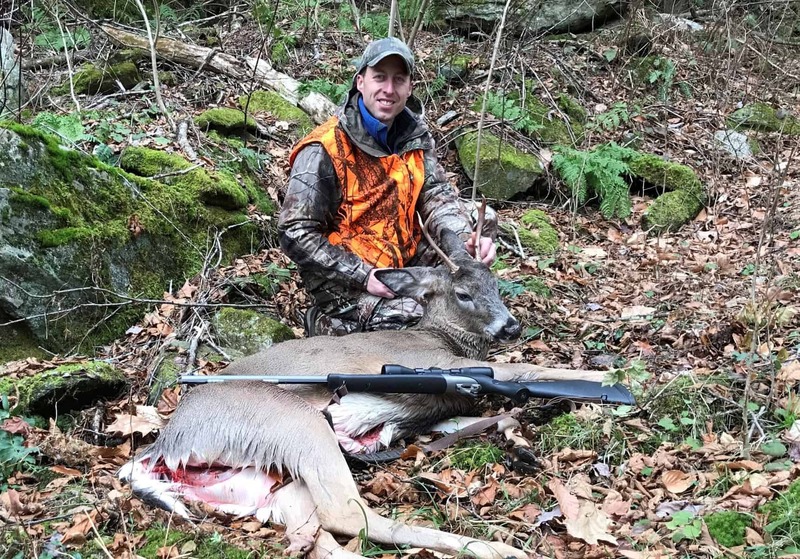 With a new bullet seated nicely on dry pellets of powder and a new primer in place, I shouldered my gun just as the buck stepped out of his hiding place to see if the mysterious cloud had cleared. I centered the crosshairs behind his shoulder and pulled the trigger. This time my muzzleloader performed as expected and the buck died after running approximately 100 yards. I do believe this hunt accurately sums up my season. It was just one of those years where circumstances fell into place despite my best efforts to mess things up. When possible, I have been hunting in Vermont and New Hampshire since September 16th, and this buck was only the ninth deer I’d seen to date. Interestingly enough, six of those nine deer were confirmed to be bucks. 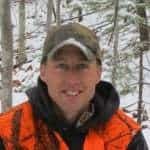 Four I confirmed before shooting them, another was a nice racked fella I saw during bow season in NH, and the other was a button buck Sam and I saw while bowhunting together. We let that one go even though he looked super tasty. I’m really maturing as a big buck hunter. I’m not sure what I’d do if people found out I shoot little bucks too. It’s been a good year – better than I deserve. Thanks for reading! Please come back again!